Stephen Parry set up Ryburgh pottery in Norfolk in 1981. after training at Croydon collage of art , and then Dartington pottery in Devon. At his pottery in Norfolk, Steve makes small batches of individual pots, softly thrown on a momentum wheel. His pots are often thickly slipped, and then glazed with fluid wood ash glazes before firing too 1300c in a 125cu ft wood fired kiln. 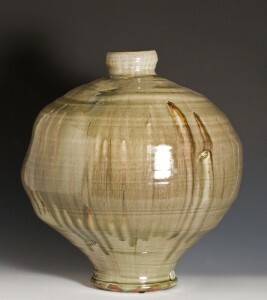 Stephen also uses an anagama type kiln, which he fires for three to four days, allowing the wood ash that enters the kiln during the long firings to glaze and colour the work. More recently Stephen has become known for his very large pots some up to 5ft tall, which are thrown and assembled on the wheel. For more information about Stephen and his work please visit his own website.